How do I ban users from commenting in my channel's chat? As the broadcaster or the moderator, you may ban users that you feel are being inappropriate in your channel's chat or social stream. Banning a user will temporarily block them from your channel for 24 hours. While you are broadcasting, go to your Dashboard, then click on Channels in the left hand column. This will reveal a list of your channels. Click on the square-in-square icon to the right of the channel name to open your channel page. 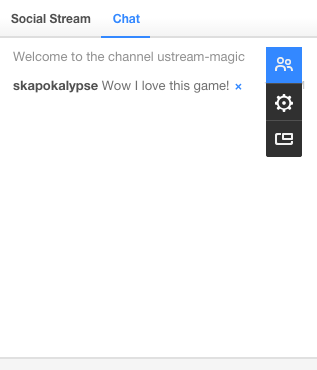 When in your channel you will see the "Chat" on the right hand-side. Click on the people icon. This will show you the list of users currently in your chat. Once you see the list of chatters, hover over the name of the chatter you want to ban. By hovering over their name, you will see a dropdown arrow. Clicking on this arrow will bring up several options, including ban. When you ban a message from a user all messages that user entered into your channel's chat will be automatically removed. Clicking this "X" will make the message disappear. How can I embed chat on my website?